Currency pressure in Brazil and Spanish speaking countries continues to create pressure on yields for LATAM Airlines Group during 1Q2014, resulting in a slide in operating revenues and a quarterly loss. It appears the effects of currency fluctuations could linger for some time, and are just one of the challenges that LATAM faces in the short term. The company is also facing competitive capacity increases in its long-haul markets and fall-off in revenues during the FIFA World Cup held in Brazil in 2Q2014 as corporate travel is expected to decline during that period. Since LAN and TAM officially closed their merger in 2012 and became LATAM Airlines Group, macro economic conditions in many of the carrier’s markets have worsened, adding layers to the existing complexity of combining two carriers. With the short-term challenges likely to linger, achieving a double digit margin performance could shift to a medium-term target. 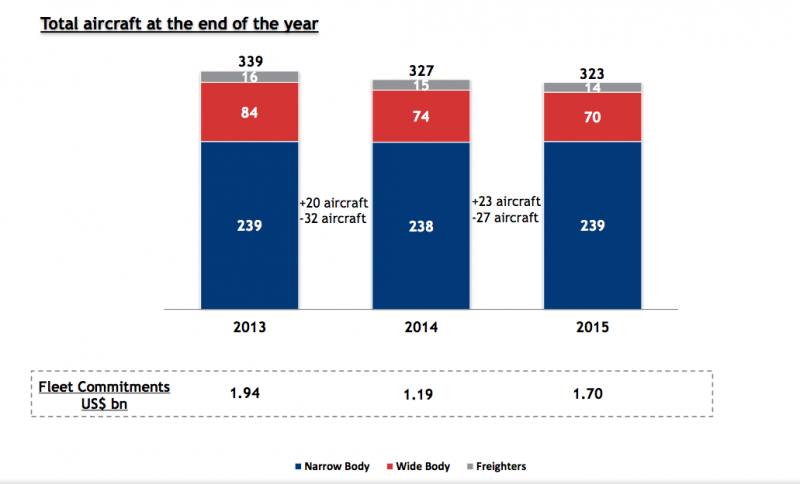 Yields for LATAM Airlines Group fell 6.6% year-on-year in 1Q2014 as unit revenues remained flat or fell in each of the company’s geographical regions. LATAM estimated currency depreciation of 17% year-on-year during 1Q2014 in Chile, a 9% decline for Peru, a 12% depreciation in Colombia and a 50% decline in Argentina. In total LATAM’s Spanish speaking countries represent roughly 16% of LATAM’s revenues. Brazil's currency fell nearly 19% year-on-year in 1Q2014. The company estimated that Argentina represents roughly 8% of its revenues, and it has increased sales in other parts of its network to compensate for the drastic fall in the Argentinean currency, but admitted those sales netted lower yields than in the Argentinean market. LATAM executives explained that the carrier is seeing yield improvements in its Spanish speaking markets in local denominated currencies, but the depreciation is diminishing that strength, which is a scenario the company expects to continue. 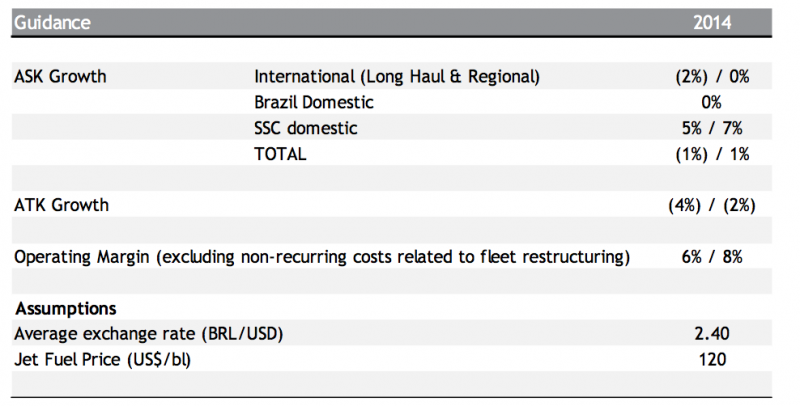 LATAM cut its capacity within Brazil by 3.5% in 1Q2014. Its traffic growth was essentially flat, but the lower supply helped lift load factors on markets within Brazil by 3.4ppt to 82%. The company has been adjusting supply in Brazil for the last year as the country’s economic weakness has created a drag on Brazilian demand. Unit revenues declined just 1% year-on-year. But LATAM estimated its overall corporate revenues within Brazil grew 20% year-on-year in 1Q2014, reflecting the carrier’s continuing focus on maintaining a strong position among business passengers while instituting a price stimulation strategy to capture leisure customers. LATAM’s performance in Brazil’s corporate sector is not likely to show the same strength in 2Q2014 as in 1Q2014. The FIFA Word Cup soccer tournament gets underway in Brazil during Jun-2014, and LATAM has offered a long and short-term view of how the event will affect its business. Over the long-term LATAM believes the infrastructure investment by Brazil, including airport upgrades, is a positive development in lifting the country’s visibility on a global scale. But in the short-term there is uncertainty regarding demand during the World Cup, particularly among corporate customers who book seven to 14 days in advance. LATAM also believes Brazil's residents who would normally vacation during the Jun-2014 and Jul-2014 time period may choose to stay home and attend World Cup matches. All of those factors are likely to create a revenue shortfall in Brazil for LATAM as corporate traffic falls due to a higher number of holidays in Brazil during the tournament. LATAM does not appear poised to deflect some of the pressure in its domestic markets in Latin America by leveraging strength in its long-haul markets as company executives concluded that weakness on long-haul markets to Europe remains intact and capacity additions by US carriers to Latin America is creating some competitive pressure. In late 2013 Delta added capacity to Sao Paulo from its Atlanta and Detroit hubs as it works to leverage its partnership with Brazil’s second largest carrier Gol. TAM’s official entry into the oneworld alliance in Mar-2014 may ease some of the pressure from long-haul capacity increases by other US carriers. oneworld anchor carrier American Airlines presently (11-May-2014 to 17-May-2014) holds a nearly 41% seat share between the US and Brazil, which should help shore-up TAM’s codeshare revenues as American now feeds traffic to TAM on its service between the US and Brazil. LATAM is in the midst of a fleet simplification project designed to phase out Boeing 737s and Bombardier Q400s (operated by LAN Colombia), Airbus A330s and A340s by 2016. The fleet renewal got underway in 2013, and by end CY2014 LATAM expects to phase out all the remaining 737s Q400s, and redeliver one A340 and seven A330s. During 1Q2014 LATAM recorded costs stemming from the fleet adjustments of USD147 million – USD34 million in maintenance and operating expenses and USD112 million posted as non-operating costs. 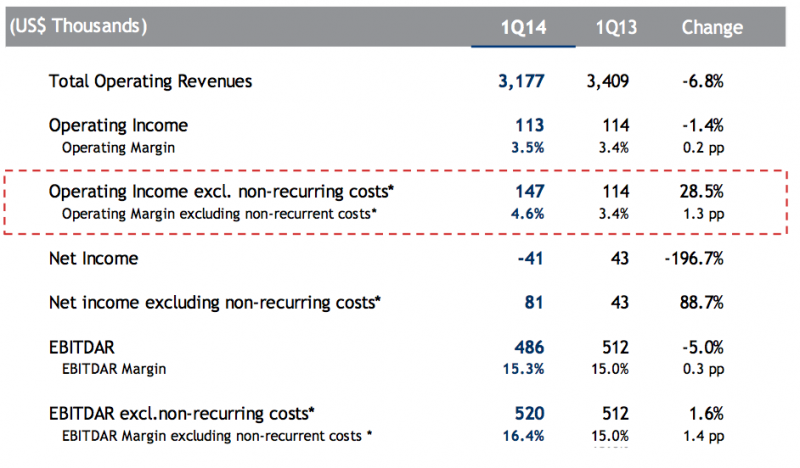 Those expenses resulted in LATAM posting a USD41 million loss for 1Q2014 compared with a USD43 million profit the year prior. Absent the fleet expense, LATAM estimates its profit for the first three months of 2014 would have reached USD81 million, an improvement of nearly 89% year-on-year. LATAM’s fleet alignment is necessary as fewer aircraft types and newer aircraft replacing older jets should eventually produce cost advantages for the company. The Boeing 787s replacing LAN’s 767s should result in 12% reduction per ASK while the A350’s ASK reduction is 20% versus the TAM A330 aircraft. LATAM also estimates the A320neos scheduled for delivery beginning in 2017 have a 6% lower unit cost than existing A320s and A321neos have a 13% unit cost advantage over the A320. 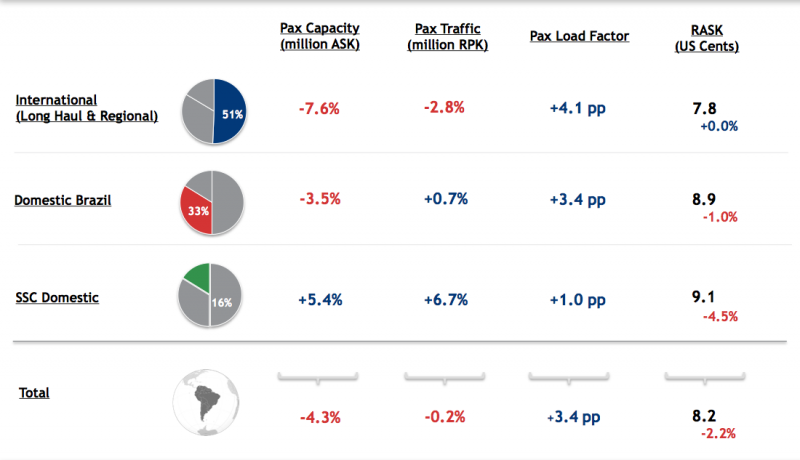 LATAM is likely to incur some additional expense as it works to align its fleet post merger. During CY2013 it recorded USD29 million in fleet renewal expense, which results in a total of USD176 million in fleet costs through 1Q2014. LATAM’s currency challenges coupled with some tough forecasting surrounding the World Cup is resulting in the carrier hinting that it will likely fall toward the lower end of its 6% to 8% operating margin guidance for CY2014. Since the LAN-TAM merger’s completion LATAM has seemingly had one short-term crisis or challenge after another as it works to leverage the power created by the combination of the two major airlines. Its current spate of pressure is largely a carry-over from 2013, and begs the question of when short-term obstacles become medium-term challenges. LATAM unfortunately closed on the merger as macro economic conditions in one of its largest markets, Brazil, weakened dramatically. Its improvements in that market had barely taken effect when currency woes hit LATAM’s other strategic markets in South America. All of that pressure was in addition to normal ripples created by integrating the networks and operations of two large carriers. All of those dynamics create a scenario that make it difficult for LATAM to predict with any certainty when the combined carrier will attain the historic double digit margins enjoyed by legacy LAN. For the time being LATAM’s timeline for reaching that margin milestone could fall in the medium term or beyond.